In some parts of Australia's much-loved reef, 70 percent of the coral has been killed by bleaching. Australia is pledging vast amounts of money to mitigate the loss and stop a UNESCO downgrade of its status. Coral bleaching at Australia's heritage-listed Great Barrier Reef was worse that first thought, government scientists announced on Monday. Up to 70 percent of the coral has been killed in some parts of the 2,300-kilometer reef system, due to rising sea temperatures during March and April. Some 2,500 scientists, policymakers and managers came together in Honolulu in June 2016 for the world's largest summit dedicated to the future of coral reefs. With coral reefs threatened by global warming, participants at the 13th International Coral Reef Symposium are calling for a joint rescue effort. The event gathered guests from 97 countries, including the presidents of Palau, Micronesia, and the Marshall Islands. Coral reefs are a key source of income in those countries, mostly through tourism. The Pacific nations are worried about the future of their tourist hotspots, as coral reefs face so-called "bleaching" due to rising sea temperatures. "If our coral reefs are further degraded, then our reef-dependent communities will suffer and be displaced," leaders of Palau, Micronesia, and the Marshall Islands said in an open letter. Bleaching happens when coral is stressed by hot ocean waters or other changes in the environment. In response, corals may release tiny symbiotic algae which drains them of color. More importantly, bleaching affects their ability to feed and reproduce. Severe or prolonged bleaching might kill off corals entirely. 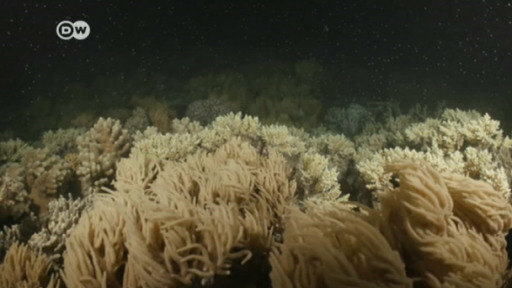 Scientists have detected bleached coral in the past two years in oceans around the world. They expect the process to continue thought 2016. The 2,300-kilometer-long (1,429-mile-long) Great Barrier Reef is the world's largest coral reef system and its largest living structure. It is also among Australia's main tourist attractions, generating around $3.9 billion (3.5 billion euros) annually. Almost one-half of the coral in the reef's northern third have died in the past three months, according to James Cook University professor Terry Hughes. The most affected area is remote and unpolluted, with very little fishing and no coastal development. "That's an absolute catastrophe," Hughes said. "There's nowhere to hide from climate change." Despite the bad news, scientists claim the problems can be managed with proper funding and political backing. "We are not ready to write the obituary for coral reefs," Professor Hughes said. The scientific community at the conference pledged to work with leaders across the world in order to "curb the continued loss of coral reefs." "As has been the case with reefs across the world, the Great Barrier Reef has experienced significant and widespread impacts over the last two years," the chairman of the Great Barrier Reef Marine Park Authority (GBRMPA), Russel Reichelt, said in a statement. "We're very concerned about what this means for the Great Barrier Reef itself and what it means for the communities and industries that depend on it." The area hit hardest was north of tourist hotspot Port Douglas, where an estimated 70 percent of shallow water corals died. Across the whole reef, 29 percent of shallow water corals died from bleaching in 2016. Initial estimates had put the figure at 22 percent. Deeper water corals were affected but scientists were unable to systematically assess them. Southern parts of the reef escaped the worst. Coral bleaching and the effects of Cyclone Debbie will likely cause further loss in 2017, the report said. "Ongoing bleaching, tropical cyclone Debbie, crown-of-thorns starfish and coral disease are all having impacts," a government statement said. "The long-term trend of coral decline is expected to continue and accelerate." Terry Hughes, head of the Australian Research Council's Centre of Excellence for Coral Reef Studies, said on Twitter that about 19 percent of the reef had been bleached so far in 2017. "Australians will be shocked that the nation's top reef scientist says about 50 percent of all the Great Barrier Reef's coral has been killed by bleaching in just two years," WWF-Australia Head of Oceans Richard Leck said in a statement. "The Reef is a global treasure and on our watch global warming has cooked half the coral." Bleaching occurs when abnormal conditions such as warmer sea temperatures cause corals to expel tiny photosynthetic algae, draining them of their color. Corals can recover if the water temperature drops and the algae are able to recolonize them, but repetitive bleaching events can make recovery difficult. In April the Australian Council released a report that found bleaching could cost the region 1 million visitors a year and AU$1 billion (665 million euros or US$745 million) in tourism revenue. "Over the next two to three decades, bleaching events are likely to become even more frequent and severe in Australia, with catastrophic impacts on reef health and the economy," the report said. "Extremely warm water [is] causing particularly severe bleaching now in the middle sections of the reef, which of course is where most of the tourists visit," ecologist Lesley Hughes said. "This will have enormous economic and employment consequences for Queensland." The UNESCO World Heritage organization will decide in July whether to list the reef as "in danger," prompting political concern in Australia. In a bid to appease the council, Prime Minister Malcolm Turnbull pledged a AU$1 billion fund to address water quality and ecosystem health. This month Foreign Minister Julie Bishop took 75 foreign ambassadors on a snorkeling trip to show off its preservation efforts and to fight back against claims the reef was dead. China's Ambassador Cheng Jingye told local daily "Cairns Post" that he planned to relay to China's leaders how the Reef was "well-preserved." Last week the GBRMPA hosted a summit with more than 70 of the world's leading marine experts to discuss possible responses, such as developing coral nurseries, strategies to boost culling of crown-of-thorns starfish, expanding monitoring systems and identifying priority sites for coral restoration. Chairman Russel Reichelt said the need to slash greenhouse gas emissions was key to the talks. Many countries around the world agreed in Paris in 2015 to limit average warming to 2 degrees Celsius (3.6 degrees Fahrenheit) over pre-industrial levels, mainly by trying to curb fossil fuel usage. Could manmade clouds save the Great Barrier Reef?